Cancún (/kænˈkuːn/ or /kɑːn-/; [kaŋˈkun]) is a city in southeastern Mexico on the northeast coast of the Yucatán Peninsula in the Mexican state of Quintana Roo. It is an important tourist destination in Mexico, and the seat of the municipality of Benito Juárez. The city is on the Caribbean Sea, and is one of Mexico's easternmost points. 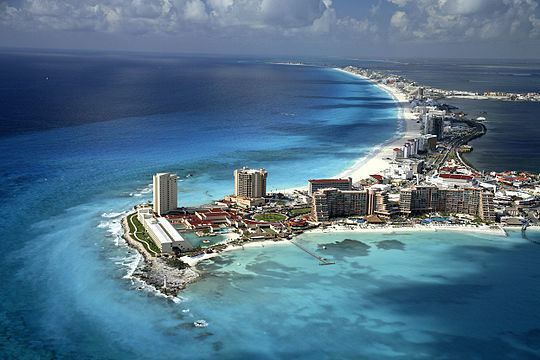 Cancún is just north of Mexico's Caribbean coast resort band known as the Riviera Maya. In older English-language documents, the city’s name is sometimes spelled "Cancoon," an attempt to convey the sound of the name. The shield of the municipality of Benito Juárez, which represents the city of Cancún, was designed by the Californian Mexican American artist Joe Vera. It is divided into three parts: the color blue symbolizes the Caribbean Sea, the yellow of the sand, and the red of the sun with its rays. The city began as a tourism project in 1974 as an Integrally Planned Center, a pioneer of FONATUR (Fondo Nacional de Fomento al Turismo, National Fund for Tourism Development), formerly known as INFRATUR. Since then, it has undergone a comprehensive transformation from being a fisherman's island surrounded by virgin forest and undiscovered shores to being one of the two most well-known Mexican resorts, along with Acapulco. The World Tourism Organization (WTO), through its foundation UNWTO-Themis, awarded the Best of the Best award "for excellence and good governance" to the Trust for Tourism Promotion of Cancun on February 3, 2007. This award ensured Cancún the ongoing support of the Department of Education and Knowledge Management of the WTO. To save on the cost of installing sewer systems and other public services, the design of much of the rest of the city reverted to the grid plan after Hurricane Gilbert in 1988. The newest upper-middle-class residential areas reflect the original plan, but are much less intimate. Less expensive developments are composed almost entirely of identical one- or two-story small row-houses, sometimes built around interior plazas or 4 story apartment blocks.Until recently, most mainland buildings were four stories or shorter; since 2005, there has been an influx of condominium and luxury retail and office space concentrated along Ave. Bonampak. Despite being a young city, Cancun has a memorial monument of its foundation on a replica of the old Airport Control Tower that resembles to its own date of foundation. The original Control Tower was a provisional wooden structure to satisfy the operative needs of the recently created airport. Some documents of the city mention that on that time there were no other formal buildings constructed in the city, being possibly the first built structure of Cancun's recent history. The old airport was located on the same part of the city that today corresponds to the Kabah Avenue. The tower is 15 meters tall, has a staircase of 45 steps, and has a base dimension of 5 x 5 meters. The memorial was first built in 2002, with the donations of Aerocaribe, a local airline, but the structure was damaged after Hurricane Wilma in 2005. After the claims of the local people asking to rebuild the tower memorial, a new version was built on 2010, which was later abandoned without proper maintenance until Woox Pinturas, another local wood maintenance company, made a donation to restore the structure to its original appearance. Cancún is served by the Cancún International Airport with an added main runway that commenced operation as of October 2009. It has many flights to North America, Central America, South America, Asia, and Europe. It is located on the northeast of the Yucatán Peninsula serving an average of about fifteen million passengers per year. The airport is located around 20 km (12 mi) from the hotel zone, approximately a 20 minute trip by car. The island of Isla Mujeres is located off the coast and is accessible by ferry from Puerto Juárez. 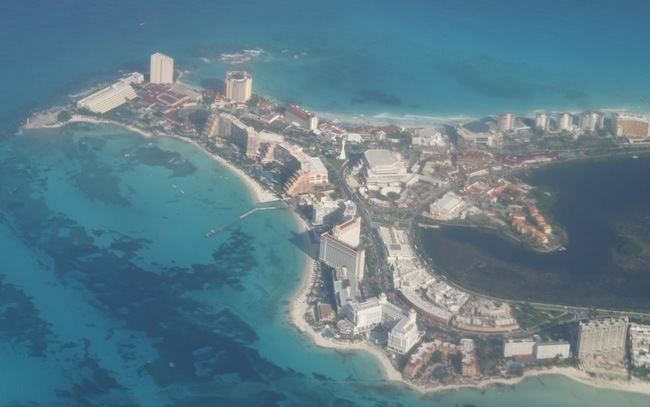 Cancún has a tropical climate, specifically a tropical wet and dry climate (Köppen Aw), with few temperature differences between seasons, but pronounced rainy seasons. The city is warm year-round, and moderated by onshore trade winds, with an annual mean temperature of 27.1 °C (80.8 °F). Unlike inland areas of the Yucatán Peninsula, sea breezes restrict high temperatures from reaching 35 °C (95 °F) on most afternoons. Annual rainfall is around 1,340 millimetres (52.8 in), falling on 115 days per year. More temperate conditions occur from November to February with occasional refreshing northerly breezes, it is drier and becomes hotter in March and April. It is hottest from May to September, due to proximity to the Caribbean and Gulf humidity is high the year round, especially so during hurricane season (averages close to 70% on rainfree days). The hotel zone juts into the Caribbean Sea, it is surrounded by ocean therefore daytime temperatures are around 1-2C less and windspeeds are higher than at the airport located some distance inland, which is the official meteorological station for Cancún, averages as shown below. The city has been home to Atlante F.C., a traditional Mexico City football club, since 2007. Atlante F.C. was moved to Cancun's Andrés Quintana Roo Stadium when that stadium opened. Its games had low attendance at its previous stadium, Azteca Stadium, which it had been renting. The team currently plays in the Ascenso MX, the second level of the Mexican association football pyramid.